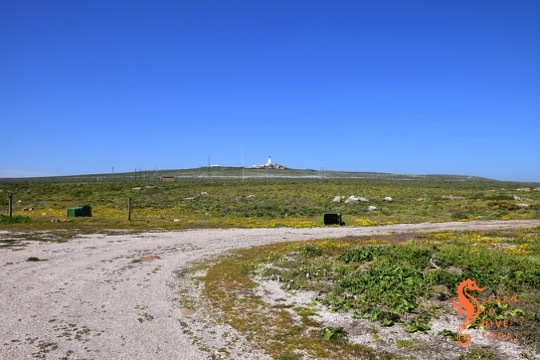 The Cape Columbine Nature Reserve is just outside the small fishing town of Paternoster on the West Coast. 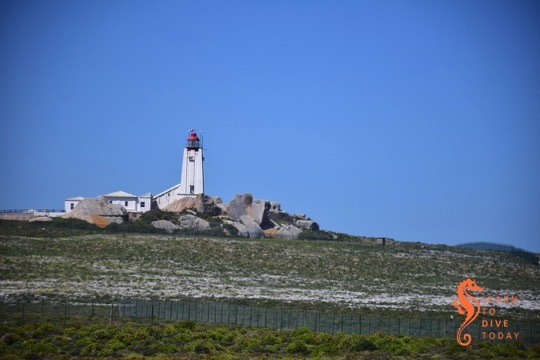 It’s the reserve that contains Tietiesbaai campsite, and is a popular camping location during crayfishing season. Tony and I camped there several years ago, and enjoyed the space and the ability to set up anywhere we wanted to. Inside the reserve is the Cape Columbine lighthouse, which has an art deco feel to it. Built on top of a rocky outcrop called Castle Rock, it was commissioned in 1936. The lighthouse is a 15 metre high masonry tower topped by a 5,040,000 candela light with a range of 30 nautical miles. 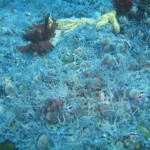 It covers a particularly treacherous coast, prone to fog and gales, and with many hidden reefs. 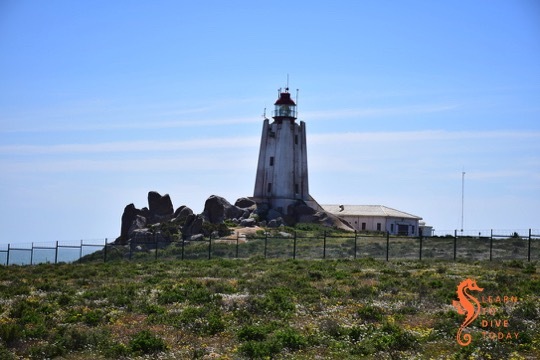 Cape Columbine lighthouse is manned, and can be visited by the public on weekdays between 10.00 and 15.00.Cape Columbine was the last manned lighthouse to be constructed in South Africa. We haven’t passed by on a weekday yet, so I haven’t been inside. As of late 2018, the Cape Columbine lighthouse needs a coat of paint! When we camped at Columbine Nature Reserve in 2009, the lighthouse was in much better shape. I took the picture below on that trip. 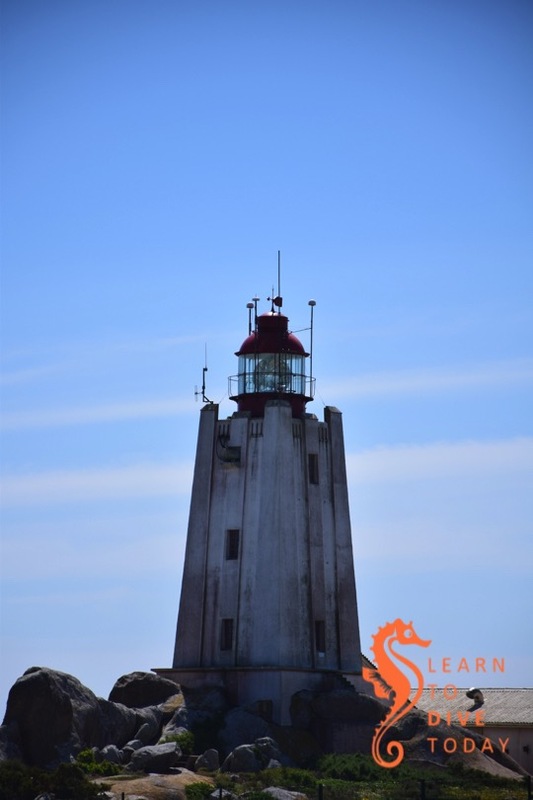 If you drive around the lighthouse, you may see a small green tower inside a fenced off area that houses a fog detector, and a fog signal that sounds when fog is detected. This apparatus used to be housed at the lighthouse, but in 1995 the opportunity was taken to move both sets of devices (detector and signaller) closer to the sea. 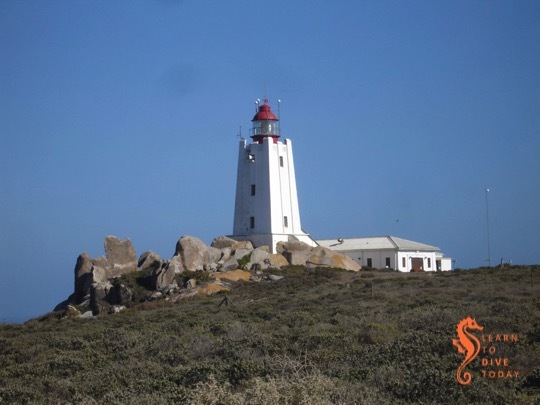 Learn more about South Africa’s lighthouses from Lighthouses of South Africa. We dived Long Beach today in surge, strong current and lousy visibility. It is full moon and we have had some swell but I was hoping it would be ok – it wasn’t. Weekend conditions do not look ideal for recreational (fun!) diving. Better luck next week I hope. Here are some holiday reading recommendations – not too taxing, not entirely insubstantial – to enjoy while lounging under an umbrella by the pool or waiting for a flight to board. You will probably enjoy them because they’re about marine life, and I assume that if you didn’t have a passing interest in the ocean, you wouldn’t be reading this blog. Longform is a website that provides reading recommendations – usually (as the name suggests) long form stories, not restricted to a particular range of topics. I am a subscriber to the Longform newsletter, and lately a user of their iPad app. The Longform guide to sea creatures is a short list of juicy long articles whose common thread is that they focus on marine animals. I’ve shared some of them with you already – Killer in the Pool and Moby Duck being the most notable. Others are about giant squid, octopus, tuna, whales, and the Loch Ness monster. It’s a page worth bookmarking, should you anticipate requiring a couple of hours of thoughtful, fact-checked, well researched reading on the subject of marine life. 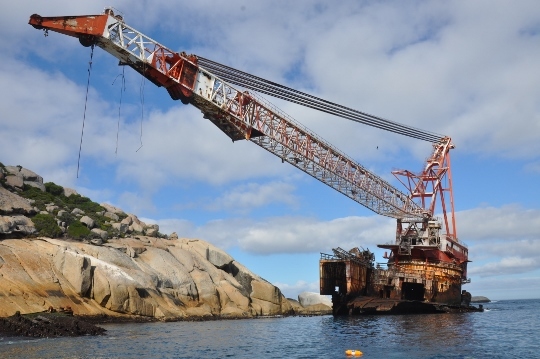 Vulcan Rock is a dive site just outside Hout Bay. 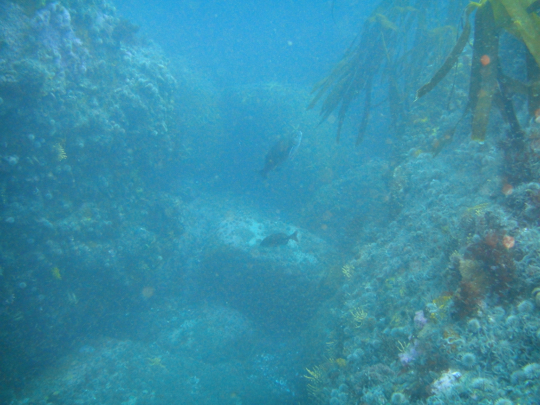 We dived it on a day when the south easter had been blowing for a while, so the visibility was quite good. The dive site is essentially a huge stack of granite boulders, with Vulcan Rock as the highest point. 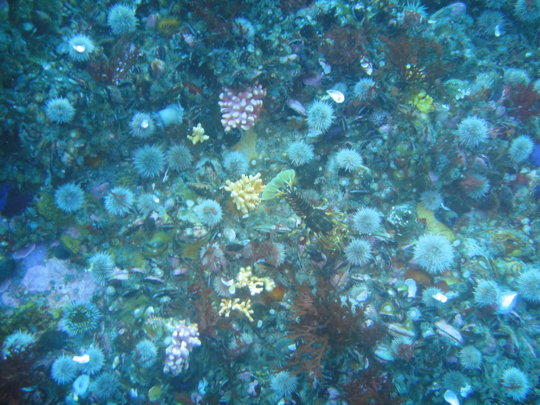 The rocks are covered with sea urchins, rock lobster, corals, sea cucumbers, brittle stars, and a bit of red seaweed. Esther and I stayed within the range of Open Water divers, not going deeper than 18 metres, but it is possible to go as deep as 30 metres at this site if you go for a bit of a swim. 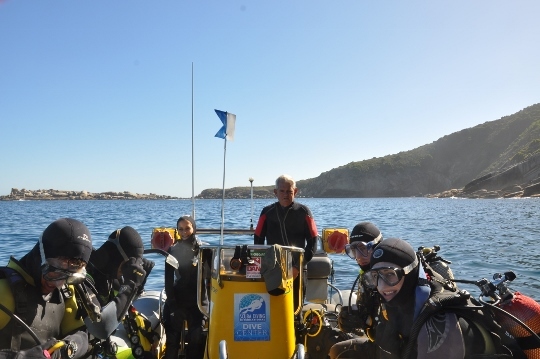 This is definitely a site to visit when the surface conditions are good and the swell is low (not that Hout Bay diving is ever great – or particularly safe – in a big swell). I had the little Sony camera with me and took some happy snaps. Underneath all the granite is an enormous cave, with several entrances. Peet, who joined us on this dive, made a video of the cave that I will share with you later this week. Who you gonna call (if you see a poacher)? I still volunteer once a month (when my car is working properly) at the Two Oceans Aquarium in Cape Town. Tinus, the Operations Manager, recently shared details of who to contact when a poaching operation is observed. The aquarium sometimes gets calls about poaching from concerned members of the public, but there are direct routes to report it and you should use those. Tinus has agreed for me to share the information here – the wider the audience the better! Alternatively, or for environmental offences throughout the republic, whether marine or terrestrial, the 24 hour toll free number for the Environmental Management Inspectorate is 0800 205 005. During office hours, you can also contact the Green Scorpions on 021 402 3361, 021 402 3430 or 021 402 3506/16/25/29/33. Hopefully you will not have to resort to this, but should the agencies above not respond as required by law, please contact the National Anti-Corruption Hotline for Public Service, 24 hours toll-free on 0800 701 701. It would be nice if there was a similar number to report parties damaging and looting shipwrecks that are older than 60 years – does anyone know of one? Posted on 6 December 2014 27 November 2014 Author ClareCategories Abalone, Fish, Government, Lobster, Poaching, SalvageTags conservationLeave a comment on Who you gonna call (if you see a poacher)? 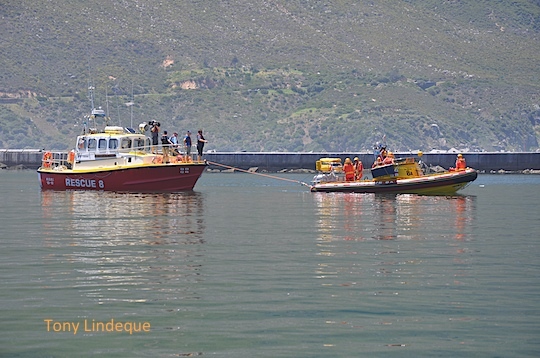 The NSRI recently assisted the occupants of a 5.5 metre rubber duck (for scale, almost a metre shorter than Seahorse, which is rated for seven passengers and a skipper) when their single engine failed off Gansbaai. There were eleven divers on the boat, and it was 11.30 pm when they were rescued. 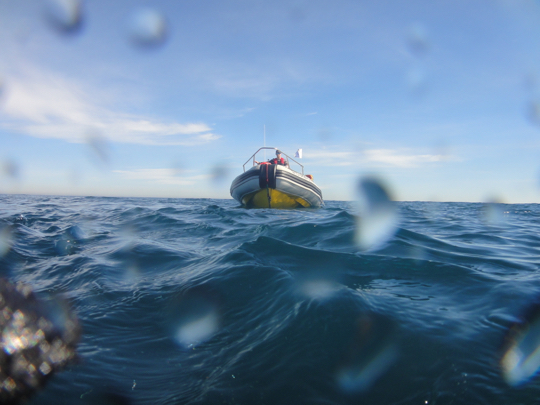 The NSRI report of the incident specifically states that the divers were “recreational”, but it is highly likely that they were poachers, illegally harvesting abalone or possibly rock lobster. The NSRI report was shared on a number of facebook pages maintained by members of the local scuba diving community (including ours). One comment thread in particular, in one of the groups where the report was shared, made me very sad. Multiple commenters suggested that the NSRI should have left the poachers out at sea to be eaten by sharks, and there was even distasteful speculation about the race of the men who were rescued. It’s very easy, on the Internet, to write that you think someone should be abandoned to die, or that they deserve it – but that doesn’t make it a right sentiment. The speed at which we get updates on social media make it easy for us to fail to engage with the nuances of events and situations, and rather to pass swift judgments and wish death on some mother’s child. Sea Rescue is the charity that saves lives on South African waters. Our crews put their lives at risk in order to save the life of a stranger. They will voluntarily go to sea in the worst conditions, to help anyone in need. Nothing there suggests that they will first pass judgment on the activity you’re engaged in, or on how wise you were to go out in such bad sea conditions, and then decide whether to assist or not! Fisheries management in South Africa has been performed with aggressive incompetence for the past five or more years, with a focus – by the authorities – on personal enrichment and the fruits of corruption. (If you want to learn more about this, I suggest you read the whole of the Feike Management blog, and then start making serious plans to get off the grid, given that the former minister of fisheries is now brokering nuclear deals with that global pariah, Russia.) Management of our abalone stocks has been done on the basis of wishful thinking and illegality. He explained his poaching work as we sat amid the plants and the Rasta, whose name was John, continued preparing his spliff. 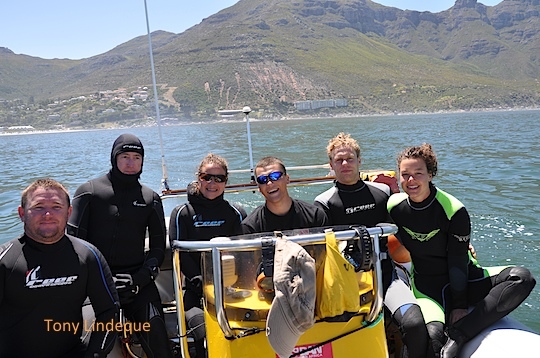 David told me he skippered a boat for a white diver who had relocated to Hout Bay to target reefs on the Cape Peninsula. 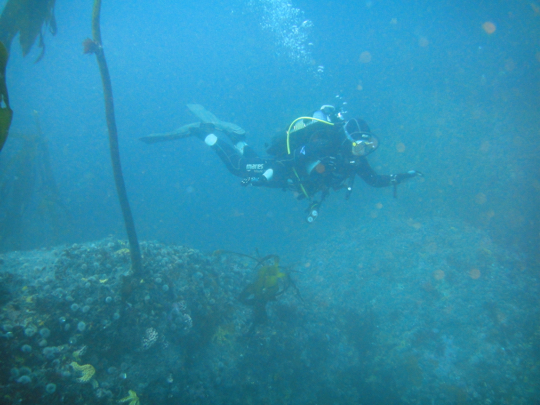 Another local diver – whom by chance I’d already interviewed – worked with them, as well as a bootsman, or deck assistant. The divers paid David R20 a kilogram of perlemoen they harvested; the bootsman earned half as much. The divers also hired carriers to run their catch to middlemen in the community, who paid prices of between R200 and R250 a kilogram. These middlemen sold the product on to buyers from larger criminal syndicates, who ultimately controlled the illicit trade to the Far East. On a good night, after expenses, the two divers could earn R10 000 each, with David taking home R4 000. 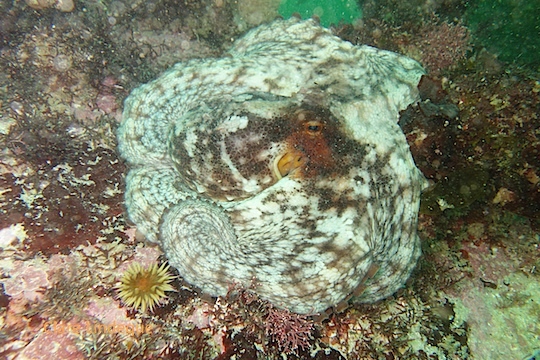 As scuba divers, we tend to see this issue quite simply: someone is illegally taking beautiful, unique creatures out of the ocean! We forget that the communities engaged in these activities are far less privileged than we are, and that this is a complicated, historically fraught issue that won’t be solved by leaving a boatload of poachers to be swept out to sea in the dark of night. I suggest you read de Greef’s article. It humanises the poachers – puts faces on them – and helps to tease out some of the more complex issues at play regarding this valuable marine resource. Johnny Steinberg did a comprehensive and more detailed review of the illicit abalone trade some years ago, which is a longer read if you’ve got time. Read the M&G article here. Father and son team Stephen and Anthony Palumbi tackle the ocean superlatives in this entertaining, easy to read volume. The Extreme Life of the Sea is riddled with pop culture references (many of which whizzed right over my head), but in between these the Palumbis conduct a tour of the most notable parts of the ocean food web. They pause at the creatures that are smallest, largest, oldest, most tolerant of heat and cold, fastest, strangest, first to evolve, and least changed since the dawn of time. The pace is rapid, but despite this the authors manage to be both interesting and detailed where necessary. There is a recurring element of storytelling as the Palumbis introduce new creatures (they cover approximately 200 species in just over 200 pages), and I can imagine a relatively young reader with a scientific bent deriving great enjoyment from these interludes as well as from the rapid fire facts that follow each lyrical species introduction. Albatross, whales, sea jellies, worms, and giant squid line up one after the other, demonstrating their particular adaptations to the environment in which they live. Billions of microbes and viruses duke it out beyond the range of human vision. 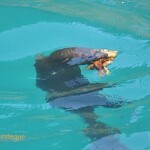 I was dazzled by how different all marine life is from humans, and how ridiculously varied. … over the long term the oceans don’t need saving. People need saving. people will need to live through the next hundreds or thousands of years when the oceans are no longer the pantry of the world, no longer safe to swim in or sail across, toxic and wracked by ever-stronger storms… The fate of the oceans has become our fate too, and we are out of easy ways to ensure that the future of the ocean is secure. Reviews at the Washington Post, The Independent, The Guardian, and Scientific American, if you crave more. You can get a copy here or here. If you’re in South Africa, here. He centres his book on the community of Little Cranberry island off Maine, a ridiculously beautiful island with a small permanent population, sustained by fishing for American lobster. These crustaceans can weigh up to 20 kilograms and are the heaviest in the world. He interweaves stories of the lobstermen at work with stories of the scientists who study the animals, and with details of the life of lobsters. (The title of the book is apt.) His characterisations of all of the individuals who appear in the book are fully formed, and by the end one feels a warm familiarity for many of them. 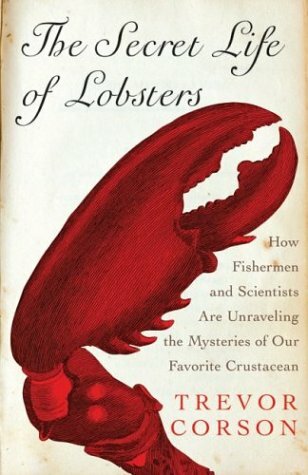 At the heart of the book is a conflict between scientists employed by the United States government to make recommendations regarding the management of its fisheries, who insisted for years that the lobsters of Maine are overfished, and the lobster fishing community, which has seen catches rising, has implemented their own measures to protect very small and very large lobsters and females (one of which is notching the tails of actively breeding females to indicate that they shouldn’t be kept), and is convinced that the stock is healthy. Corson makes no secret of his antipathy for the “government scientists” who predicted the fishery’s disappearance and his disdain for their fears, but fails to explain why they are so convinced the stock is in danger of collapse. New England, the primary range of the American lobster, is the site of the devastating failure of a massive and lucrative cod fishery (in short, they were all eaten), and perhaps this failure informs the scientists concerned with excessive caution. The Maine lobster fishery has, since 1995, evolved a system of co-management between regulations set by the government to manage the fishery, and management systems imposed and maintained by the fishermen themselves. This is an innovative and effective way of avoiding a “tragedy of the commons” (here’s Garrett Hardin’s original paper) that can arise when a common resource is free to be exploited by everyone. The Maine lobster fishery is presented at the end of Elinor Ostrom’s 1998 paper on coping with tragedies of the commons, as an example of how decentralised (or polycentric) management systems can work for common resources such as fisheries, clean water, or clean air. With very few government patrols, the fishery is kept regulated largely by its participants – the fishermen themselves. This is a fascinating success story. James Acheson, an economic anthropologist, has studied this fishery extensively. Some of his papers can be found here and here. Attempts to manage marine resources in a centralised, top down manner don’t work (c.f. 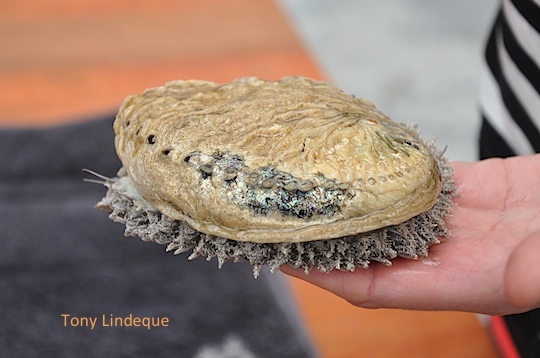 abalone in South Africa – or all our fisheries, for that matter), and co-management solutions in which industry participates with government seem to be a very viable and effective solution. The scientists Corson profiles are renegades (at least in comparison to the government’s people), who favour experiments and field work (involving scuba dives, ROVs and many laboratory tanks of lobster) over calculations and theory, and who back up the claims of the fishermen that the lobster population is healthy. I’m afraid the demonising of the government scientists didn’t sit well with me, and perhaps with a little more explanation or attempt to understand their perspective, Corson could have presented a more nuanced take on the matter. Lobster catches continue to boom in Maine, but because of larval lobsters’ dependence on ocean currents and water temperatures to usher in each phase of their development, global warming and the resulting changes in ocean currents and ocean temperatures could impact this fishery adversely in the future. 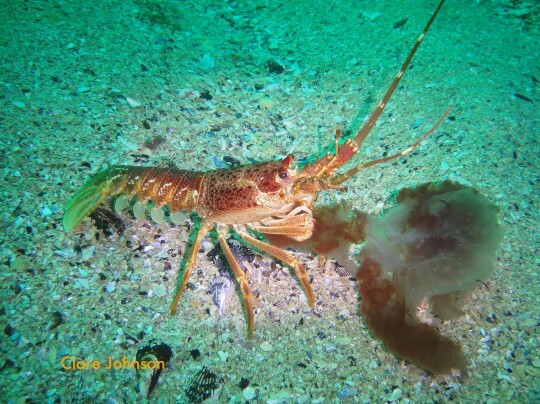 The details about lobster biology and behaviour that Corson presents are fascinating, and, I suspect, an excellent layperson’s substitute for wading through all the scientific literature on the life and times of the American lobster. He explains how the scientists reached their conclusions, too, giving detailed descriptions of experiments involving superglue, plastic tube, and long term observation of both wild and captive lobsters. I think (hope) a lot of what I learned here is generalisable to our own West coast rock lobsters: as I pointed out to Tony while I was explaining to him how male American lobsters urinate on one another from their heads while they fight vigorously over territory and mates, we don’t often observe lobsters behaving when we encounter them on dives. We sometimes see them eating, but most often they scoot backwards into a hiding place, or just gently wave their antennae at us. They have intricate social and reproductive lives, not to mention a dizzyingly complex life cycle (the difficulty of artificially replicating the conditions required for multiple larval transformations are part of the reason why they aren’t farmed like abalone). 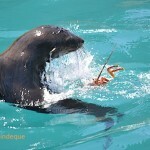 I will certainly be watching more closely next time I bump into one of these remarkable crustaceans. This book has its origins in an article Corson wrote for the Atlantic, which features many of the characters who appear in The Secret Life of Lobsters – you can check it out to see if it catches your interest. Also, a second viewing of Deadliest Catch – Lobster Wars might be in order, after everything I’ve learned from this book. You can get a copy of the book here if you’re in South Africa, otherwise here or here. 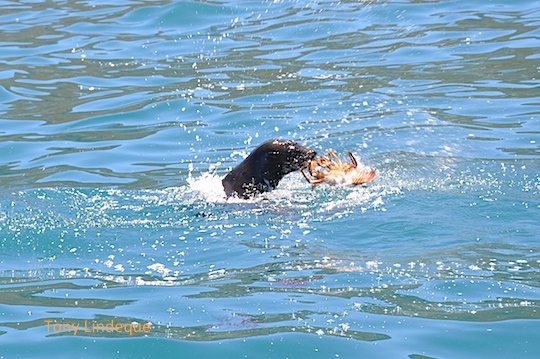 On a beautiful day in Hout Bay towards the end of last year, we were entertained by a seal that had caught a west coast rock lobster. The seal spent a lot of time parading around near the boat with his lobster, and we were suitably entertained. We dived the SS Maori and Die Josie and enjoyed the very mellow surface conditions and warm sun. I was diving with Open Water students, so Gary skippered for us. On our way back into the harbour we came across the local NSRI station personnel doing towing exercises with their two vessels. Text or email me if you want to dive. 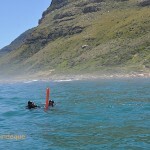 We had really good conditions last weekend and launched from Hout Bay on both Saturday and Sunday with 15-20 metre viz. The water was a little cold, 11 degrees on most computers and 9 degrees on others. 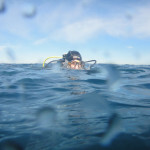 We have also dived Long Beach this week and had nice conditions. Today has been relatively calm in False Bay but right now there is a 6 metre swell with a 20 second period rolling in that will have some effect on the Bay for the weekend. It is meant to drop off by Friday, back down to around 3 metres, but the period remains high at around 14 seconds so it will be surgy. Saturday and Sunday do look a lot better with Sunday being the best of all, however weather forecasts on a Wednesday are notoriously inaccurate and all too often the forecast changes dramatically overnight. My weekend plan is therefore as follows: On Friday we will do shore dives or pool sessions. Regarding Saturday we will decide on Friday, and on Sunday we will launch very early from False Bay Yacht Club and dive Photographer’s Reef and Ark Rock. 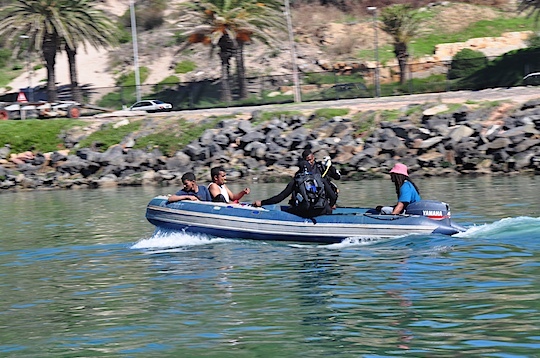 There is a plan to possibly ban diving in Betty’s Bay. The reasons is because the government is unable and unwilling to police the area in order to rein in the abalone and lobster poaching, so they are proposing to ban everyone and everything. The only thing is it will not stop poaching – it will in fact make it easier to fish illegally as there will be no one watching. You can read more about it on Indigo Scuba’s blog. Please take the time to register as an interested and affected party, and submit an objection using the template provided (or your own words). If you think this sounds far fetched, remember that there is already a ban on diving in an area in False Bay close to Cape Point for the very same reason. It sets a disturbing precedent that could one day seriously hinder our freedom to enjoy the beautiful ocean on our doorstep. There is a DAN Day on 17 May – let me know if you want more information. These are always informative events that also allow you a behind the scenes look at facilities you wouldn’t otherwise get to visit. Please remember that if you book a boat dive, you need to cancel before 16h00 the day before otherwise you will be billed for the dive. Also, make sure your MPA permit is up to date! You can get one at your nearest post office for about R100 – just take your ID along and ask for a scuba diving permit. 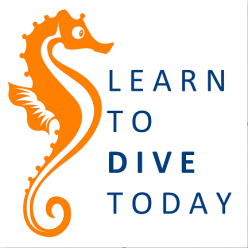 A good tip for all divers: never go deeper than the bottom.